Your colleague Henry Exadecimal has been busy upgrading the network to IPv6 to replace the old IPv4 topology. Some of the routers have been configured for RIPNG, OSPFv3 and even some tunneling over IPv4. Unfortunately Henry isn’t very good at IPv6 and the network is one big mess. 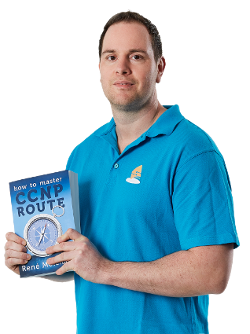 You have been studying CCNP ROUTE for quite some time so you are very familiar with IPv6…it’s up to you to fix this! R1 is supposed to receive an IPv6 prefix from R2 through autoconfiguration but for some reason this is not working. R1 should have an IPv6 default route in its routing table. You are not allowed to create a default route yourself or configure a routing protocol on R1. R3 should be able to reach the loopback0 interface of R2 but this is not working. 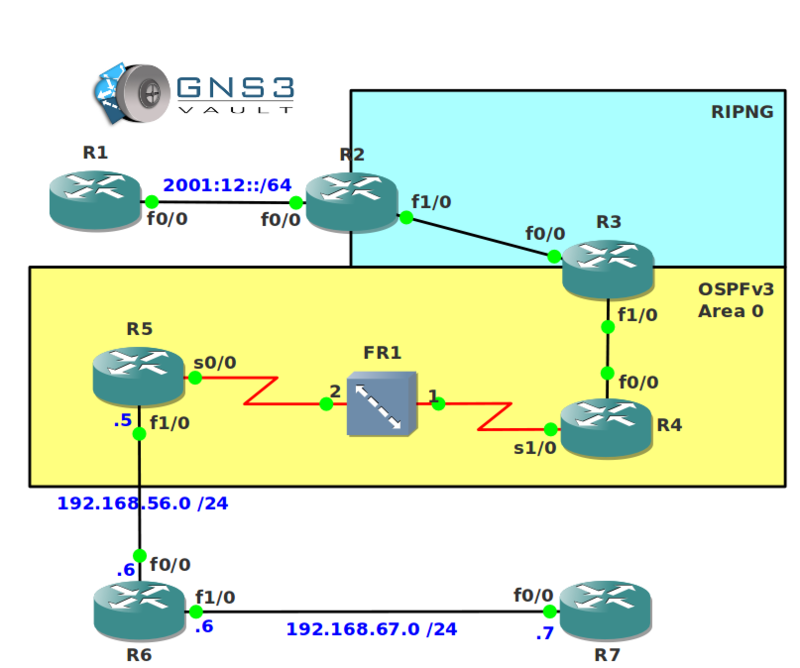 R3 and R4 are configured for OSPFv3 but for some reason no neighbor adjacency is appearing. R2 should be able to reach the loopback0 interface of R4 and vice versa, however this is not working as expected. R5 and R7 are configured for IPv6 6to4 tunneling because R6 is an IPv4-only device. For some reason the tunnel is not working. When you are finished, R2,R3,R4,R5 and R7 should be able to ping each others loopback0 interfaces. 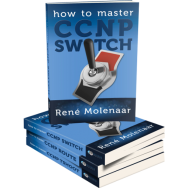 You will learn all the secrets about IPv6 troubleshooting and more. Are the config files somewhere? Also, there is no topology.net file either. Sorry, but for this lab, I don’t see them. Rene this one sais that I need to register to download the files and I think I’m already registered xP. Thanks by the way! you’re awesome! I fixed it, it’s now there. Does the debug output "Mar 1 00:28:48.803: RIPng: Suppressed null multicast update on FastEthernet0/0 for RIPNG"
have anything to do with why R3 cannot ping L0 on R2? I am stumped by that. Never mind. Forgot something else! Working now. This was a great lab! One of the best I’ve done so far. Thanks Rene. Thank you for your labs. I am wondering if you can give me a hint about a default route on the Router R1. After searching the Internet for a solution still no luck. enter your message here…[quote=rdm1860]Does the debug output "Mar 1 00:28:48.803: RIPng: Suppressed null multicast update on FastEthernet0/0 for RIPNG"
i have already registered still can’t able to download… what’s the problem?? The tunnel isn’t working I tried everything I can but no lucky, I even used google but nothing comes up. Thanks.. At last I solved this Lab. Can anyone offer some guidance with the ping between R2 loopback and vice versa, despite many attempts i am still stumped. I’m failing to ping from R2, the loopback of R2, even i enable RIPNG on this interface, even it is shown in ipv6 route rip from R3, when i ping it…it fails. What is wrong?? Did anyone ever figure this out, its the only one I couldn’t get? Sorry I meant this objective, not the previous post. I only see the startup-config “IPv6 Troubleshooting – Startup Configuration” file. there is no pre-configured ip address on this file. can someone help me to find the correct file. I have already logged in. without any success to find the proper config file.